There is something soothing about making bread. Kneading the dough until it is smooth and satiny – neither sticky nor dry. It is something that I do quite regularly at work with my primary students (usually to make pizzas), but not so often at home. Which is silly because, despite the recipe looking complex, making bread is rather simple. It just takes a little time and patience (and a nice warm spot). While the dough is sitting to rise however, you can wander away and do something else. This dough recipe is the most basic dough ever. I know it by heart. Just make sure your water is the temperature of a nice bath. Too hot, and the yeast will die instead of multiply. You can use the dough to make pizzas (this quantity is enough for our family of five) by rolling it thin and baking it quickly, or you can use it, like I have, to make a loaf of bread. If pumpkin and feta isn’t your thing, try some pesto and cheese, or sundried tomatoes and olives, or just herbs and garlic. The choice is yours. With the school holidays coming up, give each kid a small knob of dough to knead for themselves. Have a go, and send me a pic (or tag me on facebook or instagram). Trust me when I say, home made bread, warm from the oven and spread with lashings of butter is one of the simplest, best pleasures in life! Place the yeast, sugar, and warm water into a large bowl. Allow the mixture to sit until it begins to froth on the surface. Add in the plain flour and salt and use your hands to bring mixture together as a dough. It should be moist but not sticky. Add more flour if necessary. Once a dough has formed, knead it on a clean bench for 5 minutes or until the mixture becomes smooth and springs back when you poke it. Place the dough back in the bowl, cover with cling wrap, and place in a warm place for one hour or until the dough doubles in size. Dice the feta, pumpkin, and chives and place in a bowl. When the dough has doubled in size, turn the mixture back on to a clean bench, and knead for a few minutes. Divide the dough into 20 small, even balls. Flatten the dough balls into rounds approximately 8cm in diameter. Place a spoonful of pumpkin and feta onto the half of the rounds. Place a plain round on top of each pumpkin and feta round. Grease a 21cm by 10cm loaf tin. Stack the round on their sides into the loaf tin, so that they are packed closely together. Allow the loaf tin to stand in a warm place for 30 minutes. Brush the loaf with milk. Serve with lashing of butter. 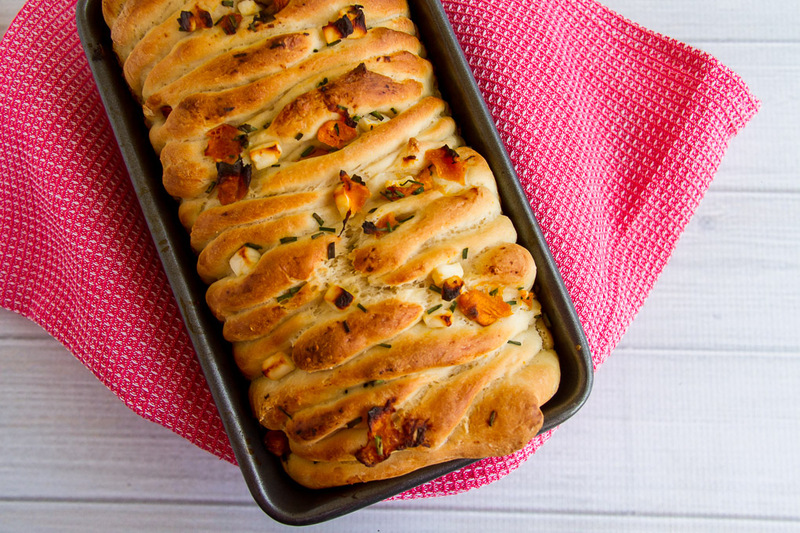 Have you ever made your own bread? Got some tips? Pull aparts have a very special place in my heart. I used to work in a bakery (many moons ago now!) and they were the one thing that I just couldn’t resist. My favourite was always spinach and feta. I can’t wait to try my hand at this recipe, Jo! 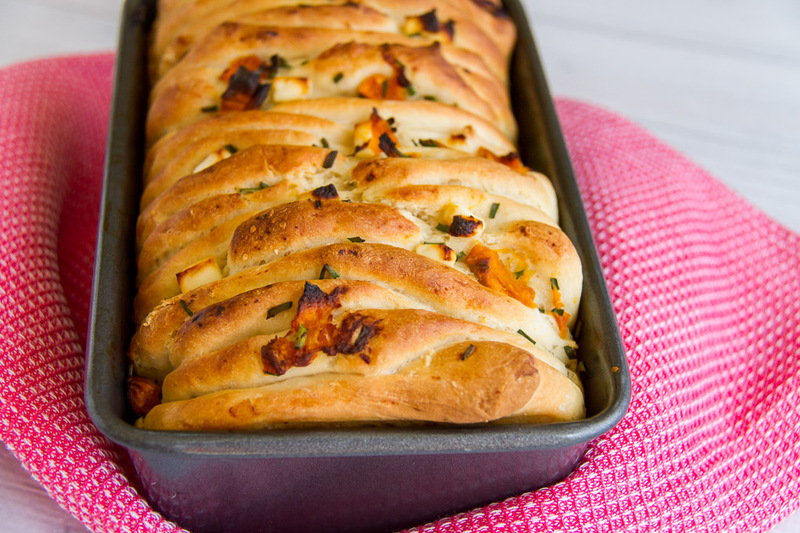 Oh this looks fabulous, I really LOVE pull apart breads and adding pumpkin and feta is such a brilliant idea! Thanks Lauren – pull aparts are just so easy! I don’t think I’m that good a baker – but I really want to give this recipe a go! 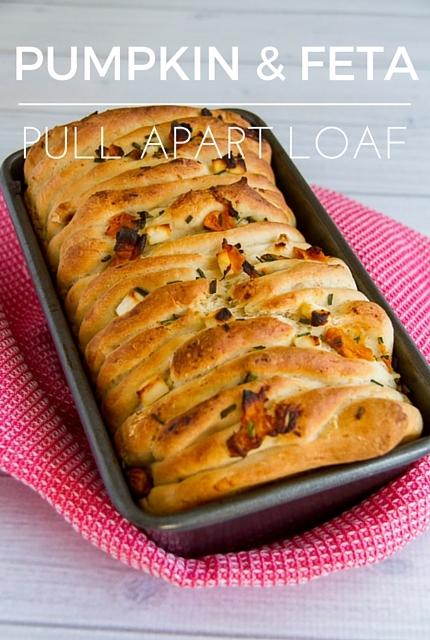 I’ve never made pull apart bread but you have made it sound achievable and very tasty. I’m going to give it a go! Thanks so much for sharing it on YWF too.